June 19, 2017 - Tell Senators and Representatives to include our 10 hours minimum rest provision along with a Fatigue Risk Management Plan (FRMP) in their respective bills. Congressional fatigue studies confirm we need more rest. This is about safety, health and equality - the flight deck has 10 hours minimum rest and so should we. 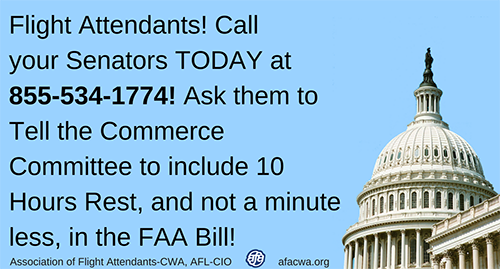 At a recent Senate Hearing, Senator Maria Cantwell (D-WA) promised to include AFA's 10-hour minimum rest and a Fatigue Risk Management Plan in the FAA Reauthorization Bill this year. 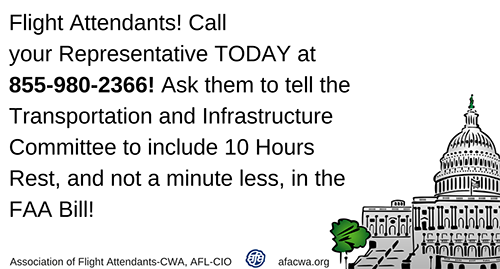 Call your Senators TODAY at 855-534-1774! Call your Representative TODAY at 855-980-2366! Calling is easy: When you dial the number, you will automatically be connected to one of your Senator's and Representative's offices after a brief message. It may take several attempts to reach both, so keep calling!